Giada De Laurentiis has a new cookbook Happy Cooking which is scheduled to release on November 3rd, 2015. According to the book description, it has 200 recipes and helpful advice on potlucks, open houses, and what to pack for lunch. It also features "New Year's cleanse, homemade Christmas gifts, and ideas for every holiday, special occasion, and casual weekend in between." Giada De Laurentiis is the Emmy Award-winning star of Food Network's Everyday Italian, Giada at Home, and Giada in Italy; a judge on Food Network Star; a contributing correspondent for NBC's Today show; editor-in-chief of a weekly digital magazine, Giada and author of seven New York Times bestselling books. Plus Giada recently celebrated the 1-year anniversary of her acclaimed Las Vegas restaurant. Her newest cookbook Happy Cooking, is one of the most highly anticipated cookbooks of the year! Joined by a moderator, Giada will share her inspiration for her Happy Cooking. An audience QandA will immediately follow each interview. 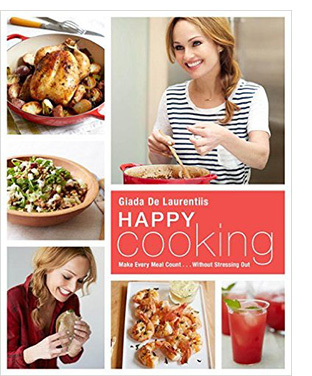 Don't miss your chance to see Giada live on stage during her upcoming book tour! Williams-Sonoma is the proud bookseller of Happy Cooking for the tour. They are now offering ticket-holders the opportunity to preorder an autograph copy of Giada's new book to be picked up at the event for purchase online at Williams-Sonoma.com. So, if you are interested in seeing Giada in person, she may be coming to a city near you in November.